Structural Engineer Alex Brown of Creighton Manning, second from right, reviews a site plan with students and technology teacher John Hartnett, far right. 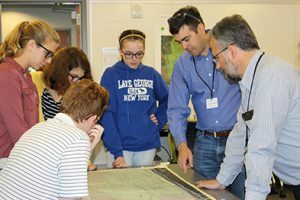 The integrated Geometry/Design and Drawing for Production (DDP) class at Tech Valley High School partnered with Creighton Manning Engineering to create site plans for a residential subdivision property off the Northway in Malta. Students worked in teams to draw the plans, which had to include roadway layouts with access points and right-of-ways, lot layouts of 25 single family homes, as well as a park. The plans had to meet local codes and include a wetland buffer. The teams presented their final projects earlier this month to Creighton Manning Structural Engineer Alex Brown. Brown said partnering with TVHS for this project offers a fresh perspective for his firm. “We often have set ideas about how these plans are completed, so it was great to see the students’ creativity in their solutions,” he said. Freshmen Maeve Corcoran and MacKenzie Squair recently told the TVHS Business Alliance about the benefits of project-based learning in terms of their engagement level for the course. The site plan project was one of the first they completed since starting at TVHS in September. “It’s still definitely math. It’s still DDP. But this is so much more real, and it’s real life applications that are much more modern and relevant,” Corcoran said. Corcoran said she appreciated how Brown visited the class to introduce the project and evaluate it. Squair said she likes how the courses are integrated. “Our project has geometry and DDP aspects, and that’s more realistic, because you wouldn’t just work on a project like this using just geometry,” she said.